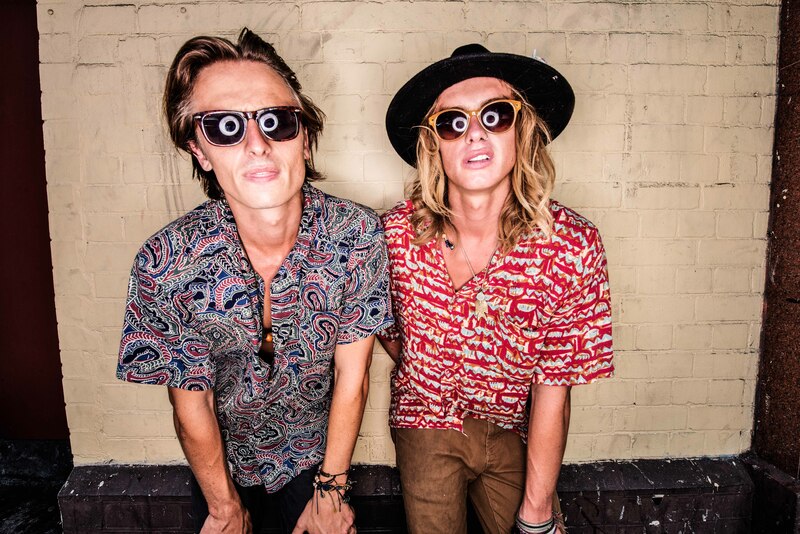 At the core of genre-defying Sydney outfit Lime Cordiale are brothers Oli and Louis Leimbach. The likeable, down-to-earth, and extremely talented duo sat down for a chat with me ahead of their set at this year’s BIGSOUND. How are you, guys? Big plans for tonight? Louis: Yeah, dude, this is hell fun. Have you been here before? Yeah, I came last year. Louis: This is our third time. We have so much fun here; there’s so much going on. Do expect anything different this year? Oli: We don’t really want anything to be different [laughs]. Oli: For some reason I like this vibe, the small stages, better than big stages and big acts. It’s way more intimate. And do you think it’s the kind of festival that could be extended to three or four days? Louis: They could do a week. Maybe more bands and more stages! So, new music for you guys tonight? Oli: Yeah, we’re in the middle of recording some new stuff at the moment. We’ve only got one more day of recording, as long as our managers like it and the producer’s into it. We’ve been working with this guy called Jean-Paul Fung in Sydney who’s a mastermind young dude. He’s only 25 – a year older than me – so it’s really cool working with someone our age. He’s on the same page, then? Oli: Yeah, he’s on the same page. Louis: No wankiness to him. Is it an album in the works? Oli: Yeah, I mean, eventually. At the moment we’re really concentrating on three songs and we’ve got two other songs kind of half-recorded, and some other things, but we’re just trying to get a single out and then we’ll have a bit more time to finish off everything else. Looking at quality over quantity, then. Oli: Yeah, exactly. We don’t want to just rush an album, give it out and everyone’s like, ‘Yeah, there’s nothing good on there…’ [laughs]. You guys have been touring a lot, obviously, and you’ve been to the States a few times now. How did you find that experience? Oli: We spent most of our time in LA and we’ve got this kind of love-hate relationship with it. Like, we get there and it’s really hot and, you know, it’s not the most beautiful-looking city, but there’s so much going on and everything’s so cheap. Whenever we get back here, we have a Tuesday night, you’ve got heaps of energy and you just want to do something… that’s so easy in LA. There’s so much buzz going on. But yeah, we travelled the rest [of the US]. We did this huge driving tour in a van and drove hundreds of hours; we saw so much of it. And you guys did South By Southwest (SXSW); that must have been a crazy experience too. Louis: We played seven shows in a week, I think. Six or seven. It was pretty amazing. Oli: It’s like this (BIGSOUND), on cocaine. Oli: There was an Aussie Barbecue on, and there were like 50 Australian acts playing there, which was sick. What was the weirdest venue you guys played, amid all of that? Oli: Some venues you could hear the band next door pretty much just as loud as you were playing, so as soon as you stopped a song it was like four different bands coming in. You don’t go there and go, ‘Yeah, someone will see us and take us on,’ because there’s like two and a half thousand bands. We just released an EP over there so we’re advertising that a bit, and you go there with a little bit of something up your sleeve, if you can. Oli: Supposedly it’s happened before, but you never really know. Louis: It’s just there’s so much music. Oli: And then someone drove a car through the crowd. Yeah! How did that affect everyone? It must’ve been a surreal experience to have been there and have that happen. So, more touring planned for this year? Oli: Yeah, we’re going to do a tour with The Delta Riggs. We’ve been listening to them heaps. I saw them a while ago, just stumbled across them in Sydney. I remember going, ‘I haven’t heard of these guys, I’ll go and see it,’ and I was so into it. 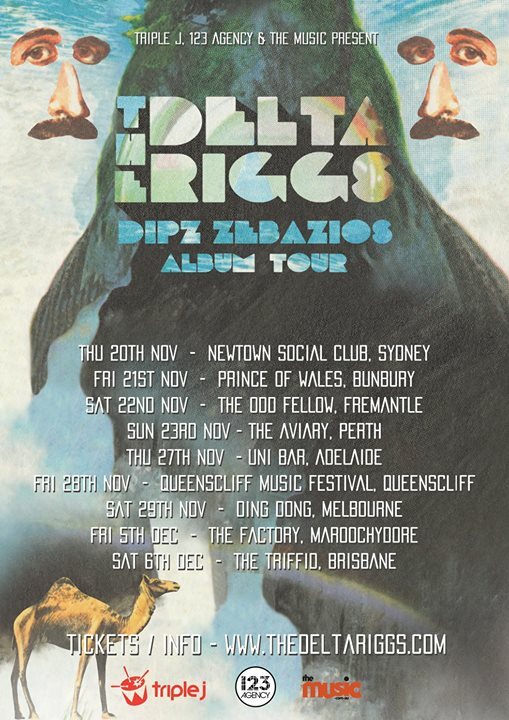 So yeah, we’re going to do that tour and that’ll be really close to a single release for us. That’ll be so much fun. I remember seeing them at BIGSOUND last year, and he (frontman Elliott Hammond) picks up his beer and just pours it over the keyboard. Louis: Oh my God, yeah, he did that; he was playing keys when I saw them and the beer was on top and he just splashed it everywhere. Oli: He actually just poured it over his keyboard? Just fucks it up? Love it. What can I pour beer on tonight? If you guys could travel anywhere in the world and perform, where would that be? Oli: I’d love to do Europe. Europe would be really cool. In the States, it’s really diverse, but you’ve still go to another city and you’ve got your Denny’s and your McDonald’s and bloody Dairy Queen and stuff. There’s a lot of it that is the same. In Europe, it’d be crazy. Just going to Paris and then travelling down through Italy… Far out, it’d be amazing. Louis: We went to New Caledonia last weekend and played three shows there. That was pretty amazing. What was the vibe there like? What kind of crowds did you get? Oli: I don’t think they get much going on over there [laughs]. Louis: They just loved it. So good. Beautiful country. Oli: Everything’s really expensive. You get a burger and chips for like $35. It’s cool, though; there’s reef just off the beach. It’s really sweet.